I know a lot of us burnt orange types are scoffing those little upstarts in Boise right now for being ranked ahead of Texas. They play in the WAC, which might as well be the Sun Belt of the West Coast. Well, they’re bringing back 20 starters from a team that beat TCU last season – no small feat, except that those Frogs came out of a weak-sister conference as well. I think anytime a team has gone 26-1 over the last two seasons and returns that many guys NOT placing them in the top 10 is criminal. I’d be more alarmed at Florida losing Saint Tim and being ranked ahead of UT (they’re 4th, the Horns are 5th) than Boise’s AP ranking. Bringing back 20 starters from an undefeated BCS win season is unreal. I can’t bring twenty out of twenty-two socks back from the dryer, yet the Smurf Turf crew is loaded. Heck, the one guy on defense they lost – Kyle Wilson – is probably going to start at corner for the Jets unless they get the Revis situation under control. 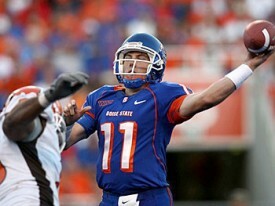 Boise State has a little left-handed Major clone with the unfortunate name of Kellen Moore. If he was in Lubbock last season, he would have worn a practice jersey with “Brock” or “Rusty” on the back. This kid has lost one game over the past two seasons – some 3rd rate bowl in San Francisco to TCU, later avenged – and put up 39 TD’s to 3 picks in 2009. I don’t care if he’s playing East Dillon 14 times a year – that’s impressive. I can’t even do that on varsity mode on NCAA 10 with Colt and Ship. 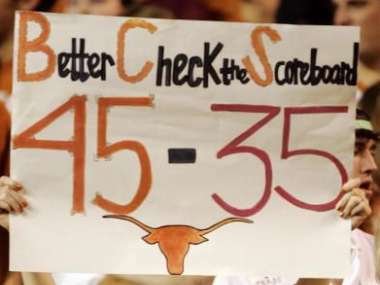 Most Longhorn fans I know think Boise and remember a bunch of trick plays, a marriage proposal to a cheerleader, a dumbfounded Bob Stoops, and a night in January five years ago where they were every UT diehard on the planet’s second favorite team. They do have some games this year that don’t involve weak conference play – opening at Virginia Tech and then having Oregon State coming to town two weeks later. If they win both of those and run the table they can go to the championship game for all I care. The David versus Goliath matchup against someone like Bama, Ohio State, or even UT will be compelling television and a probable mismatch. Beating two loss OU was magical, sure. These guys want to play with the grown-ups now, and they’ll be treated as such when the time comes. I don’t think they’re the third best team in college football, but they can take a #3 ranking in the preseason when we’re comparing stats, past performances, and predicting the future. Why not? The paper is all there – starters returning, 09 won-loss record, and a favorable schedule. Is it fair that they’ll play one, maybe two (if the Beavers knock off the Frogs in Jerryworld week one) ranked teams all year and Texas has a four game stretch with Tech, UCLA, OU, and Nebraska? Hell no it isn’t. There’s a very real chance we get to cheer on the BCS computers after the Horns go to Lincoln and win and the Broncos get San Jose State at home the same night. The only real injustice a #3 preseason ranking does is if it results in shutting an undefeated BCS team out of the championship game. If that happens, I’ll get back on my soapbox and whine. A lot of consternation amongst Texas fans but the Horns have debuted at number 3 in the BCS rankings. Not much reason to worry, with #1 Florida and #2 Alabama set to face off later in the year all Texas has to do is win out and they’ll end up in the BCS title game. For the Longhorns, their season will come down to one game. 60 minutes on October 17th determine their standing within the college football landscape and their ability to control their own destiny in terms of the Big 12. Expect a contest that is truly worthy of the superlatives it will receive both before and after, and expect a close and exciting Longhorn win. The Longhorns make up half of our national title picture, as they finish the regular season 12-0, win the Big 12 title, and try their best to right the wrongs from 2008. Check out their full Texas preview now and the entire OTP top 25. Why he was picked: After struggling with injuries most of his career, Shipley blossomed as the Longhorns’ leader in all-purpose yards last season, producing 119.2 yards per game. Shipley snagged 89 receptions for 1,060 yards and a team-leading 11 touchdown receptions. He also made history as the first player in school history to score touchdowns by reception, kickoff return and punt return in the same season. But he is most widely known for his season-saving 96-yard kickoff return for a touchdown against Oklahoma, which turned momentum around after the Sooners had jumped to a 14-3 lead early in the second quarter. Shipley is one of the most versatile members on his team as a kickoff and punt returner and a holder on all of Texas’ placements. What 2009 will hold: If Shipley can recover from his shoulder surgery, he could develop into one of the nation’s biggest receiving weapons. It will be up to him to emerge as Colt McCoy’s prime target this season after sharing the role with Quan Cosby last season. If McCoy and the Longhorns are as prolific passing as last season, it’s not out of the question that Shipley could potentially catch 100 or more balls. That kind of season would be pivotal in the Longhorns’ hopes at making their first Big 12 championship game appearance since 2005. And it would also cement Shipley’s place among the top receivers in the school’s history. Settle it on the field? Remember 45 – 35. It’s constantly suggested that College Football is a playoff and that things should be decided on the field. Well, on October 11, 2008 that happened. Texas beat Oklahoma head to head on a neutral field. The goal of this site is simple, remind people that the game was played and we got a winner. In a situation where you must decide between two teams, shouldn’t you take the one that won the game? Visit the 45 – 35 website. ESPN.com – The Longhorns have already proved it on the field. The latest BCS rankings are out and despite the gains by [tag]Oklahoma[/tag] in the two human polls, Texas has taken advantage of the the [tag]Texas Tech[/tag] loss and moved up two spots to number two in the rankings. The computer polls are the reason the Horns are hanging on now but since the Sooners play a ranked team this week it may take an impressive Thanksgiving Day win to remind voters that the Horns actually beat the Sooners when they matched up in October.